To preserve the traditional mbira music of Zimbabwe for future generations by supporting and inspiring students to study and perform the music as well as to appreciate the cultural and spiritual context in which the music is performed in Zimbabwe; to introduce mbira music to Western culture through lecture and performance in North American communities and college campuses; to contribute to a definitive scholarly analysis of Shona mbira music and surrounding culture with ethnomusicologist Dr. Paul Berliner; to continue as an advisor and consultant for Zimbabwean mbira players who perform and teach in North America; to provide strong leadership as the Village Head of Magaya village in Zimbabwe; to serve as Zimbabwean Program Director for Nhimbe for Progress, a non-profit organization serving impoverished villagers in the Mhondoro region of Zimbabwe; to serve on the Board of Directors of Tariro, a grassroots non-profit organization working in Zimbabwe to prevent the spread of HIV/AIDS by educating young women and girls. My paid professional experience began at age 9 when, after teaching myself to play the mbira and then studying with my cousin, I started playing at biras, religious ceremonies where the mbira player calls the ancestral spirits. I quickly became known as a strong player who could call the spirits and have been working in this setting and others, described below, ever since. In 1998 I began touring extensively, performing and lecturing at universities and music festivals. 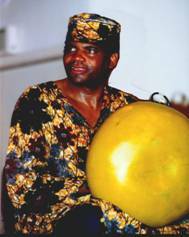 Interest in the cultural and religious aspects of Shona mbira music as well as the popularity of the music itself has grown in the West and, as a result, I have lectured extensively in these areas as well as performed the traditional music throughout the U.S. and Europe. Visiting Artist/Lecturer, University of Oregon, Eugene, OR (Dr. Janis Weeks, Dr. Mark Levy). Visiting Scholar, Center for the Humanities, Stanford University, Palo Alto, CA. Duke University, Department of Music, Durham, NC. Zimfest, University of Bellingham, WA. Board member, Tariro, Zimbabwe. Serve on the board of directors for Tariro, a grassroots non-profit organization working in Zimbabwe to prevent the spread of HIV/AIDS by educating young women and girls. Advise the board regarding financial matters and project decisions, facilitate the resolution of issues within the program and carry out the mission of the program wherever needed. Founded in 2003, Tariro is registered as a 501(c)(3) organization in the United States, and in Zimbabwe as a trust. Village Head (Sabhuku), Magaya Village, Mhondoro, Zimbabwe. Individuals in the position of sabhuku are recognized as political representatives of the land by the Zimbabwean government. In this capacity I act as Village Head for the village, mediating conflicts among villagers, making agricultural and land use decisions and resolving disputes. Project Director, Nhimbe for Progress, Zimbabwe. Project Director of Nhimbe for Progress, a nonprofit organization that works in impoverished Zimbabwean villages in the Mhondoro area of Zimbabwe. Nhimbe assists villagers by providing educational support for school-age children, health services, and resources to build huts, toilets, wells, and fuel efficient stoves. Responsibilities include monitoring project expenses, assisting with prioritization of projects, selection and oversight of Zimbabwean field staff, and providing access to resources needed for building, toilet and well construction. Depot Manager, Dairy Marketing Board, Zimbabwe. My responsibilities included sales, distribution and marketing of milk and other dairy products in the Bulawayo, Victoria Falls, Hwange, Masvingo and Mutare regions. Research assistant for ethnomusicologist Dr. Paul Berliner. Assisted Dr. Berliner with the field research for a scholarly book on the traditional mbira music of Zimbabwe, The Soul of Mbira: Music and Traditions of the Shona People of Zimbabwe. Assisted with field research and interviews, translated and transcribed song texts. Published in 1978 (initially by University of California Press, later by University of Chicago Press), The Soul of Mbira was awarded the American Society of Composers and Publishers Deems Taylor Award for Outstanding Books About Music and became a seminal work in the field of ethnomusicology. It continues to serve as a standard reference in college courses dealing with African music and ethnomusicological research, and, in particular, with mbira music. Collaboration continues with Dr. Berliner for the sequel to The Soul of Mbira, in addition to a major project to develop approaches to teaching and preserving the mbira musical tradition. 2002 Anoyimba, CD, Little Elf’s Workshop, Eugene, OR. 1973 Zimbabwe:The Soul of Mbira, Nonesuch Records World Explorer Series H-72054. This album was nominated for a NARAS Grammy Award: 1994 reissued by Nonesuch Records as a CD: 9 72054-2.